Here in Detroit, Columbus Day was celebrated from about 1896; the first official celebration recognized by local and state authorities was in 1909. Two organizations first organized the celebration: La Tribuna Italiana D’America (better known today as The Italian Tribune), our first issue was in May 1909, and the Knights of Columbus-Council No. 305. The original Editor of La Tribuna Italiana D’America, Vincenzo Giulano, initiated Columbus Day as a civic celebration in Detroit. On October 16, 1909, the Italian Tribune announced a drive to build a monument to Christopher Columbus in Detroit and made a first donation of the one hundred dollars toward the project. This monument was created by Italian sculptor, Augusto Rivala, and dedicated to the City of Detroit on October 12, 1910. 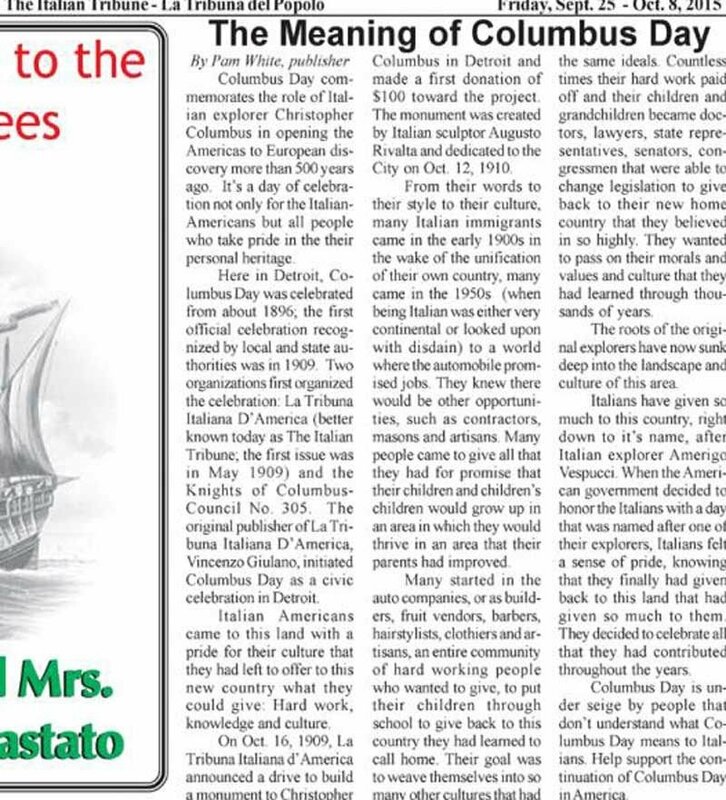 Since then, the Italian-American Community of Metropolitan Detroit has continued the Columbus Day Celebration with a calendar of events including the Columbus Day Queen Contest, Parade, Church Mass, Placing of the Wreath and a Gala Banquet where special guests and award recipients are honored. Some of the entertainment guests over the years have included, Enzo Stuarti, Soupy Sales, Buddy Greco, Anna Maria Alberghetti and Annette Funicello to name just a few. 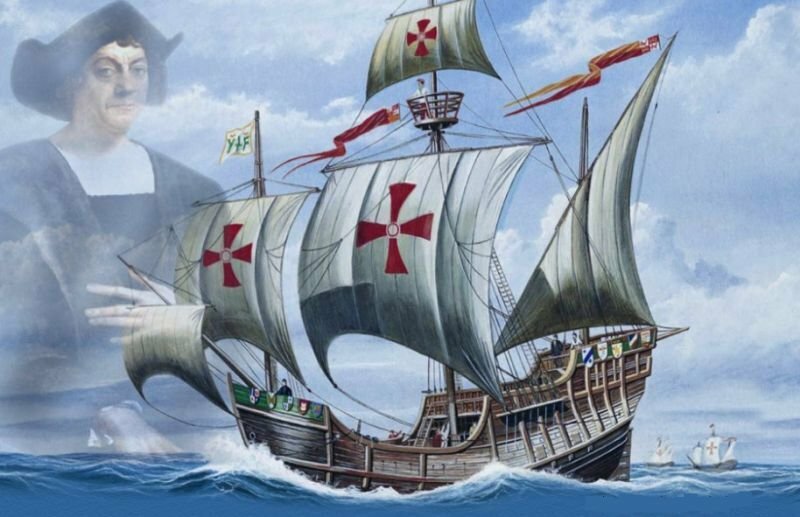 Columbus Day commemorates the role of Italian explorer Christopher Columbus in opening the Americas to European discovery more than 500 years ago. It’s a day of celebration not only for the Italian-Americans but all people who take pride in the their personal heritage. What is being celebrated, really, is the spirit of exploration and discovery of man’s needs to expand the boundaries of his world, whether it is on an ocean voyage, a trip to the moon or a tourist “discovering” the riches and delights of an Hawaiian Island. The spirit of discovery is always worth celebrating, and the use of Christopher Columbus as a symbol of that spirit is a tribute to the explorer. The Banquet this year is to be held at The Italian American Cultural Center doors open at 5:00 dinner at 6:00 tickets are $55. The historic Holy Family Church in Downtown Detroit for a mass, with a small fellowship following. After fellowship we will go to the base of the statue at Randolf an Jefferson to lay a wreath at the base of the bust of Columbus. The Columbus Day Parade begins at 11 a.m. and will assemble at approximately 9:30 a.m. The parade route will be in Mt. Clemens and begin at Main and Church and end at Main and Market. We will have an afterglow at Fern Hill Golf Club on Clinton River Rd. in Clinton Twp. The Columbus Day Committee will be taking a bus to the state capitol. The bus is by invitation only, however , this is your state capital, everyone is invited. Members and friends of the Columbus Day Celebration Committee will attend a Memorial Mass at 9:15 a.m. in honor of Christopher Columbus and the patron Saint of Italy, San Francesco at San Francesco Church in Clinton Twp. located at 16 and Gratiot. Following Mass, there will be a procession with the statue of San Francesco. Following up with fellowship. This year San Francesco Church is celebrating the 40th anniversary of this location started in 1898, 120 in all.